Why eat tomatoes ? | Ionfarms is supply for TYENT Alkaline Water Ionizer and healthy well-being eco loundry washball and Foot patches chipad. The scientific name of tomatoes is Solanum lycopersicum and they are believed to be native to Mexico. However, the Spanish colonization of America and Central America caused tomato cultivation to spread. They are an annual nightshade plant and grow in clusters of small to moderately sized, round red fruits. They have soft, pinkish red flesh and a number of seeds, as well as a slightly sweet taste. They are considered both, vegetables and fruits and weigh approximately 4 ounces. Nowadays, tomatoes are grown in countries all over the world and there are thousands of cultivars and varieties that can provide you with unique health benefits. Let’s explore a few of the reasons why they are such a valuable food item for humanhealth. The health benefits of tomatoes have been known to mankind since ancient times. They are rich sources of antioxidants that have been proven to be effective against many forms of cancer. Let’s discuss the benefits in detail. A single tomato can provide about 40% of the daily vitamin C requirement. Vitamin C is a natural antioxidant which prevents cancer-causing free radicals from damaging the body’s systems. It also contains abundant vitamin A and potassium, as well as iron. Potassium plays a vital role in maintaining nerve health and iron is essential for maintaining normal blood circulation. Vitamin K, which is essential for blood clotting and controlling bleeding, is also abundant in tomatoes. The lycopene in tomatoes prevents serum lipid oxidation, thus exerting a protective effect against cardiovascular diseases. A regular consumption of tomatoes has been proven to decrease the levels of LDL cholesterol and triglycerides in the blood. These lipids are the key culprits in cardiovascular diseases and lead to the deposition of fats in the blood vessels. The coumaric acid and chlorogenic acid, in tomatoes, fight against nitrosamines, which are the main carcinogens found in cigarettes. The presence of vitamin A in high quantities has been shown to reduce the effects of carcinogens and can protect you against lung cancer. Tomatoes keep the digestive system healthy by preventing both constipation and diarrhea. They also prevent jaundice and effectively remove toxins from the body. Furthermore, they have a large amount of fiber, which can bulk the bowels and reduce symptoms of constipation. A healthy amount of fiber helps stimulate peristaltic motion in the smooth digestive muscles and release gastric and digestive juices. This can regulate your bowel movements, thereby improving your overall digestive health and helping you avoid conditions like colorectal cancer. Consuming a tomato daily reduces the risk of developing hypertension, also known as high blood pressure. This is partially due to the impressive levels of potassium found in tomatoes. Potassium is a vasodilator, meaning that it reduces the tension in blood vessels and arteries, thereby increasing circulation and lowering the stress on the heart by eliminating hypertension. 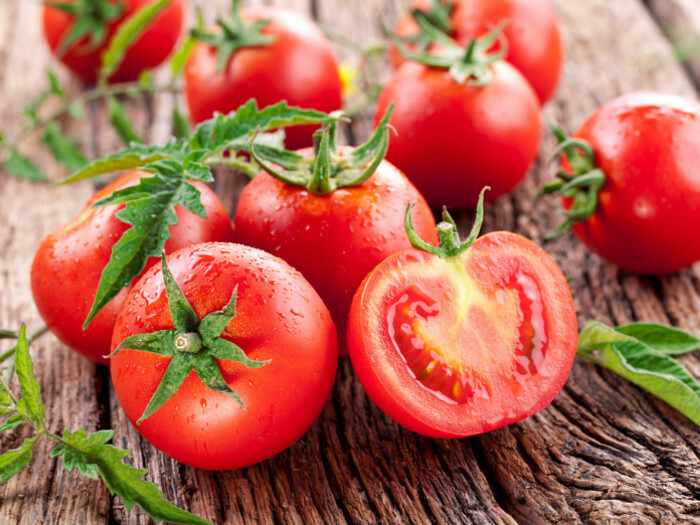 Tomatoes aid in maintaining healthy teeth, bones, hair, and skin. Topical application of tomato juice is even known to cure severe sunburns. Daily consumption protects the skin against UV-induced erythema. They rank high in the preparation of anti-aging products. Tomato intake reduces the incidence of urinary tract infections, as well as bladder cancer. This is because tomatoes are high in water content, which can stimulate urination; hence, they are a diuretic. This increases the elimination of toxins from the body, as well as excess water, salts, uric acid, and some fats as well! Regular consumption of tomatoes can provide relief from gallstones. There have been various studies to prove their efficacy against many chronic diseases and varieties of cancer. The antioxidant properties of tomatoes can also be derived from processed foods like ketchup and purees. Daily consumption of tomatoes fulfills the requirement of vitamins and minerals and exerts an overall protective effect on the body. Organic tomatoes, according to a study at the University of California, are produced in an environment that has a lower nutrient supply, since nitrogen-rich chemical fertilizers are not added. This leads to excessive formation of antioxidants such as quercetin (79% higher) and kaempferol (97% higher) in organic tomatoes. As we all know, antioxidants are good for health and help in reducing heart diseases. Moreover, chemical-based tomato farming involves spraying tomatoes with large quantities of pesticides and insecticides. Tomatoes are a highly sprayed crop throughout the world. Therefore, many organic food lovers believe that they are protected from chemical contamination when they eat the organic ones instead. Of course, organic farming is good for the environment as well!